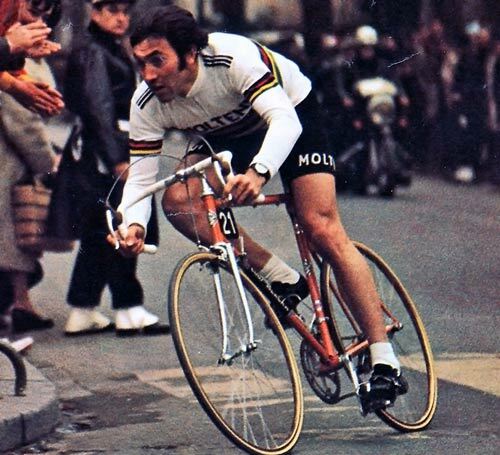 Eddy Merckx was a Belgian professional cyclists, who is widely regarded as the greatest cyclist of all time. In an illustrious career spanning both amateur and professional ranks, he won the Tour de France five times, Giro d’Italia five times, the Vuelta a Espana once – and all the major classics at least twice (finishing with 19 classic victories in total). He was world champion three times, broke the world hour record and dominated the sport like no one else has. 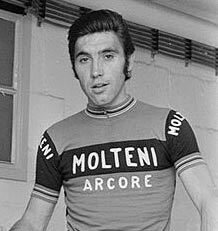 Eddy Merckx was born Edouard Louis Joseph, Baron Merckx on 17 June 1945 in Meensel-Kiezegem, Belgium. Unlike many other cycling greats of the era, Merckx’s childhood was reasonably comfortable. Whearas many contemporaries took to cycling as a way to supplement their meagre income, Eddy Merckx had more opportunities. His family would perhaps have preferred him to move into a sensible middle class job. But, for Merckx this held no appeal. It was bike racing that gained his attention, and after proving to his mother he could win early amateur races, his family supported his decision to follow the life of a pro cyclist. Merckx made a successful start to his amateur career, culminating in winning the amateur world championship in 1964. However, at the time there was no guarantee a successful amateur could make it in the pro ranks. Many former amateur world champions later faded. Merckx’s first pro contract was in 1965 at Solo-Superia under ‘the Emperor’ – Rik van Looy. Merckx said this was a baptism of fire, with no support from the established pros. 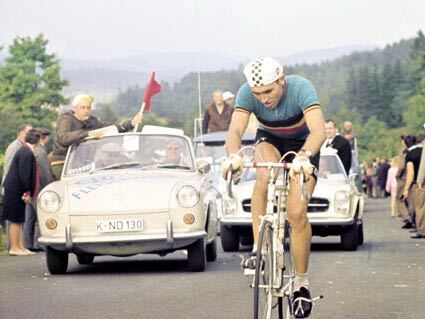 It was when he moved to Peugeot in 1966, that his career really took off winning Milan San Remo aged only 20 (it was to be the 1st out of 7 times) Out of interest his earnings at that time were 125,000 Belgian francs a year (approx 2,000 at 2008 values). Success at Peugeot led to a move to Italian team Faeme in 1968. He prospered under the Italian team winning the Giro in 1968 at his first attempt. When we look back on heroes like Merckx it is easy to look through rose tinted glasses. It is hard to imagine that at the height of his powers, he was often unpopular. The public (especially the French public) were tired of this relentless Merckx machine always winning. (Lance Armstrong would find a similar response decades later) When Merckx rode, the suspension was often lacking, there was little chance for a Frenchman to shine. In 1973, Merckx skipped the Tour, (the organisers didn’t particularly make him welcome, and he fancied winning the Vuelta instead). This public displeasure reached its height when Merckx was punched in the kidneys during a mountain top finish in 1975 (youtube clip). 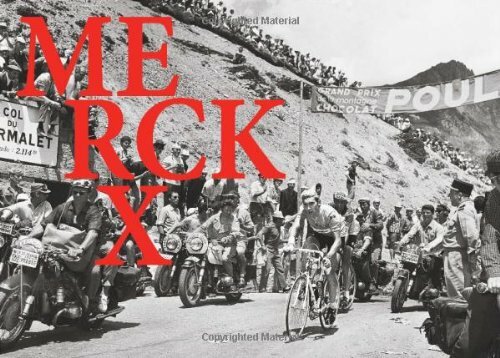 It was the first time Merckx would lose a grand tour since 1969. Without being punched, Thevenet would probably still have won, but the punch to the kidneys did cause Merckx serious health problems – not that it was in his nature to complain. Gracious in defeat, Merckx said of his rivals win. It’s perhaps shocking to hear the God of cycling treated in this way, but that is human nature – we like winners, but preferably someone who doesn’t always win or who wins in the narrowest of margins. But, Merckx insatiable appetite for success also helped the sport find a truer sporting purity. When Merckx began cycling as an amateur, the pro ranks were ruled by an unofficial mafia of the great cyclists – Van Rooy, Anquetil, … They wanted to keep a status quo of winners. Cyclists who won at the wrong time would find themselves pushed to the back of the field, and contracts hard to find. (e.g.Harm Ottenbros who became world champion in 1969 but who was soon forced out of the sport) Money was often an important motivation in settling races. It was said Van Rooy wouldn’t race until a big fat cheque was signed on the starting line. Merckx, by contrast, was motivated by something far greater than money. He did well out of the sport financially, but no-one would ever accuse him of riding for 30 pieces of silver. To Merckx, it was an inner need to win, to win in style. Every year he tried to do something new for his fans. He wanted to win everything. It is a truism that to be a great champion, you have to be 100% committed. In modern training manuals this is bandied about with abandon, but when you read the life of Merckx you begin to realise what it really means to be totally focused on one overriding passion. Merckx slept, breathed and lived cycling. When he was racing, his whole focus was on winning. He would obsessively worry about his rivals. He would relentlessly tinker with his bike carrying several spare frames and different sizes of handlebars and stems. To Merckx, no detail was too small to overlook. He would hand drill his own parts to save weight. He had a garage with over 200 spare tubulars (ageing to improve puncture protection). Few could match Merckx’s commitment to training and racing. Whilst snow and rain have us reaching for our turbo’s Merckx seemed indifferent to the worst of the weather. Fellow pro cycling, Patrick Sercu tells a revealing story which shows Merckx obsession. Liege-Bastogne Liege was on the next day. We were driving down the main road from Brussels to Liege, it was raining and snowing together, the worst conditions for riding a bike, we couldn’t work out who would be riding in such weather. It was so bad that there was no one else outside. When we passed it was Merckx, riding the 100 km to Liege, all alone because he had not won Flèche Wallonne during the week. He won Liege Bastogne Liege the next day 5 minutes ahead of the second rider. I climbed off after 40 km. Some of Merckx’s greatest moments came riding in the worst weathers. Merckx seemed to revel in cold, wet weather. Whilst his rivals were shivering in their rain capes, Merckx would take his cape off, and just ride off the front of the bunch. Why Was Merckx the Greatest Cyclist? Lance Armstrong won 7 Tour de France victories (later all victories were taken away for drug use). Others such as Anquetil, Hinault and Indurain also won five Tour de France’s. But, it should be remembered that in the cycling world, the Tour de France is not the only race, as modern media may suggest to a non-cyclist. To Belgians (and Flanderians in particular) winning the classic races are as important if not more so than the tour. Also, in the 1970s, the Giro and Vuelta had nearly as much prestige as the Tour de France. Merckx won everything, repeatedly. His dominance would start in the spring, with the great classic one-day races. This led into stage races such as Paris Nice, the grand tours, World Championships, and then Merckx would still be winning the late season classics. Great cyclists are those who dominate the classics like Van Looy, Sean Kelly. Or great cyclists who win many sprint stages in the Grand Tour like Mark Cavendish and Alessandro Petacchi. The margin of victory and style of riding. If you look at other Tour winners, their strategy is often to do well in time trials and then ride defensively in the mountains. But, in the early years, Merckx never rode defensively. He would attack in the middle of stages, a few KM before a sprint finish. He would contest sprints himself. In 1969, he achieved the rare combination of Yellow jersey, mountain classification and points. Procycling is very calculating – it’s about conserving your energy and using it when it really counts. But, that wasn’t Merckx’s style. He attacked when he felt like it – he attacked because he could. This unorthodox, unpredictable style of racing gave him a huge psychological boost. His rivals, such as Louis Ocana had tremendous talent, but also a capacity to fold in the midst of battle, the amazing thing about Merckx was his durability. For several years, he seemed indefatigable. It is said Merckx’s achievements could never be repeated. The idea of a yellow jersey attacking with 1 km to go in a stage is just impossible to imagine in the current climate of sprint trains. The idea of dominating the Tour de France after winning the Giro and sprint classics is hard to imagine. You might take it for granted Merckx would break the hour record. But, he did it in typical Merckx style. Starting off far too fast, he also went for intermediate records at 10Km and 20Km. He started so fast, he suffered like never before, hanging on desperately. At the finish, Merckx had to be carried off the bike. It is hard to appreciate the complexities of Belgian identity. Belgium was created in the nineteenth century from different cultural and linguistic backgrounds. Merckx was born in Flanders, however, later the family moved to a French-speaking district of Brussels. Thus Merckx was never entirely a Flanderian or Walloon. It was often a big topic of speculation about whether Merckx spoke French or Flanderian. Traditionally Flanders was the most passionate about cycling. The more middle class, French-speaking part of Belgium were less committed. To Flanderians, cycling was an intrinsic part of their national identity. Cyclists who won the Flanders classics like the Tour of Flanders and GentWevelgem were treated like Gods. In Flanders, these one-day classics mattered more than the Tour de France. Merckx always said he considered himself Belgian and not a Walloon or Flanderian. When he won the Tour de France in 1969, he was feted as a national hero. Kings and Prime Ministers were keen to be seen in his shadow. Merckx’s mixed nationality and proclamation he was a Belgian, probably did more to help national unity than anything else. But, somehow that was Merckx he was always going to be more than just for a small province. The one-day classics of Flanders, he won – but that wasn’t enough, Merckx had to win everything else as well. Merckx was one of the greatest Belgians. The world of professional cycling may seem glamorous, but racing up to 250 days a year in all weather is far from glamorous. So many of Merckx’s exploits came in bad weather. But, his final tour de France epitomised Merckx’s attitude to cycle racing. On a descent, Merckx fell badly breaking his jaw. Medical advice insisted that he abandon the tour. However, in typical Merckx fashion, he ignored medical advice and rode on through the pain. It had hurt him that his victory in 1974 had been tainted by Ocana’s crash and withdrawal. He felt he owed it to the race and Thevenet to keep racing. He wanted Thevenet to say he had beaten Merckx. True to his intentions, Merckx managed to gain a couple of seconds dropping Thevenet at a later stage. It was largely a symbolic gesture to show Thevenet had to really beat the ‘cannibal’. Merckx later said he regretted racing through such a bad injury. He never really recovered. But, this heroic second place, drastically changed his reputation. If the French got annoyed when he always won, they definitely could admire the courage of a Champion to keep racing, even when severely injured. It definitely made victory for Thevenet sweater – Finally, a Frenchman had defeated the imperious ‘cannibal’ It was an epoch-making moment. Merckx’s great career would never be the same again. Merckx was not without frailties and controversy. In particular, a failed dope test at the Giro in 1969 caused so much anguish he considered leaving the sport. But, surveying the overall life and career of Merckx you can’t help but conclude he was really an unpunprecedentedeat champion. He had an inner passion to greatness. If that greatness was hard to bear at the time, we can only now look back in admiration. How could one person achieve all that? Merckx dominated to the point of exasperation to his rivals, but he never abused his power and position, he didn’t become a deal maker like champions of the past. He raced hard, but fair. He may have been totally committed to winning, but it was never underhand. Merckx didn’t ride to maximise his bank account. He raced for the pure sporting glory and achievement. Merckx was driven like perhaps no other cyclist, and in doing so he raised the level and prestige of cycling. He set a benchmark for not only other cyclists, but other sports. Perhaps it is fitting to finish with words from his devoted wife. Citation : Pettinger, Tejvan. 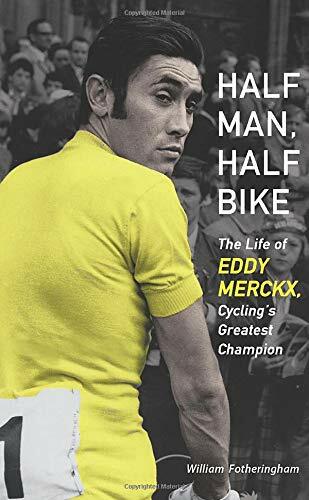 “Biography of Eddy Merckx”, Oxford, UK. www.biographyonline.net, 10/06/2012. Last updated 28 Feb 2018. In 1969 at the Tour de France, Merckx was at the peak of his powers, a joke took hold that Felice Gimondi and Raymond Poulidor were fined fifty francs for taking a tow from a lorry up the Col du Tormalet. But what about Eddy Merckx? He was towing the lorry. 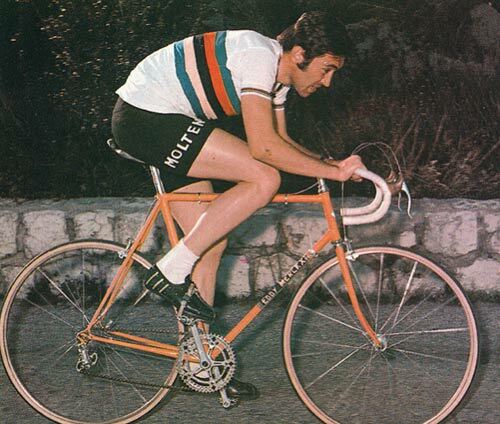 To be fair, Merckx did sprint up the Tormalet on a 53*17 – a big gear for the flat, let alone the epic mountain. 1969 was the epic tour when Merckx won by over 16 minutes. In one of the most famous Tour de France stage ever. Merckx already held the yellow jersey by 8 minutes, but concerned about a possible mishap later in the tour, he attacked on the final slopes of Col Du Tourmalet and extended this gap on a hair raising descent. At the bottom he had gained a little time on his rivals, so he just kept riding – 140Km on his own, finishing the stage in Mourenx over 8 minutes ahead of his rivals. The little Belgian had rode the professional peleton into the dust. The victory was so unprecedented and so emphatic that rivals would spend the next several years racing in his shadow, often settling for second place. Letting his opponents win was a trait that Merckx could never be accused of. Merckx had a passion for winning. It didn’t matter if it was the grandest tour or a small town Kermesse. Winning to Merckx was as necessary as breathing. If he didn’t win, he would be restless, something was missing. When questioned about whether it was fair to win so much, Merckx replied.